On Wednesday, March 30, Mr. Chiaki Takahashi, State Secretary for Foreign Affairs of Japan, received a courtesy call by 10 African Ambassadors representing the African Diplomatic Corps (ADC), including H.E. Mr. Stuart H. COMBERBACH, Ambassador of Zimbabwe, as the acting dean, and H.E. Mr. Gert Johannes GROBLER, Ambassador of South Africa. 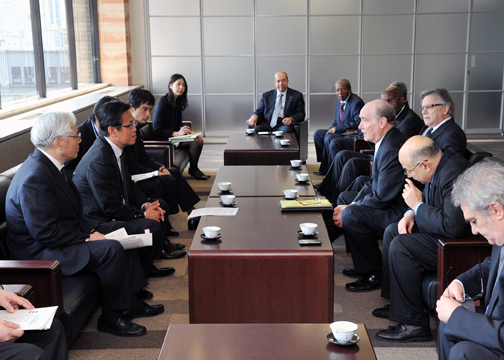 Ambassador Comberbach offered his condolences for the damage caused by Tohoku - Pacific Ocean Earthquake, and expressed the solidarity of African countries with Japan. He then stated that the ADC had decided to cancel the African day events, which had been scheduled in May 2011 and to donate the relevant budget (1.2 million yen) for those affected by the disaster. Ambassador Grobler explained the activity made in Miyagi prefecture by the South African rescue team. Other ambassadors expressed condolences, sympathy and support to Japan. In response, Mr. Takahashi expressed his deep appreciation for the support and the message of sympathy and encouragement from African countries as he appreciated the dedicated activities of the South African rescue team. He also expressed the determination of the Japanese government to overcome this difficult situation. A South African rescue team consisting of 45 members operated in Iwanuma City, Natori City, Ishinomaki City and Tagajo City of Miyagi Prefecture from March 19 until 25. So far 11 countries have offered relief money or material assistance. 49 countries and 4 regional organisations have sent message of sympathy to Japan. In addition, the ADC has announced its donation and sympathy.